Woody Mann The Art Of Acoustic Blues Guitar Ragtime and Gospel. As part of the Art of Acoustic Blues Guitar series, this volume showcases the songs and techniques of two of the most fundamental and exciting styles of traditional fingerstyle guitar playing. This program presents the music of the legendary Reverend Gary Davis, featuring several of his well-known songs. Woody Mann illustrates how the music of one of America’s greatest guitarists offers a complete lesson in the beauty and subtleties of ragtime and gospel guitar playing. Reverend Davis was one of the most gifted and original musicians of his generation. His music represents some of the most sophisticated sounds in the world of fingerstyle guitar. Since his death in 1972, Davis’s influence has continued to grow as each new generation of guitarists discovers the excitement of his music. As a teenager, Woody Man studied privately with the master. In this program, he teaches six of the Reverend’s ragtime and gospel originals note-for-note, just as Davis taught him; detailing and explaining the picking techniques, chord positions, and fine points of phrasing. Woody explores syncopated picking ideas, new approaches to chords and melodies, and explains how to apply Davis’s method for creating endless variations and improvisations within a song. Additionally, fingerpicking techniques taught can be applied to a variety of musical styles and genres. Near beginners to advanced players will benefit from this approach. Woody Mann had his first schooling as a teenager in the living room of Rev. Gary Davis, the now legendary gospel and ragtime guitarist. Mann soon went on to perform and record with blues masters Son House and Bukka White as well as contemporary innovators including John Fahey. 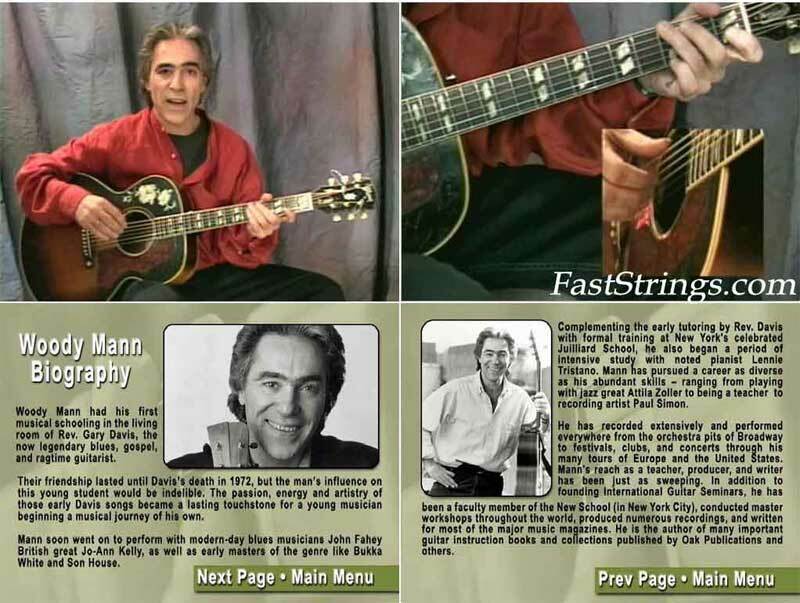 He has recorded extensively, performed throughout the world, and is widely recognized as one of the world’s leading teachers and transcribers of acoustic blues music, having taught countless guitarists through his popular books and videos. All levels. First thanks for this DVD, I learnt a lot from this. Do You have more gospel or hymns guitar DVD?